predecessor to EA Sport's Triple Play series. of solid gameplay. Worth the look. 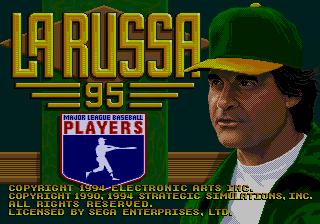 I enjoyed Tony Larrussa Basball more than any other Baseball game on the Genesis. There are flaws like the flight of the ball, but once you get used to it it becomes a fun game. Pitcher batter interface is good,you can move the pitcher on the mound and the batter in the batters box. Fielding defense is great. Alot of stats. For me Two player gameplay on sports games is everything, since Computer A.I. could always be outsmarted. Although the Triple Play Serries looks good the gameplay is subpar. 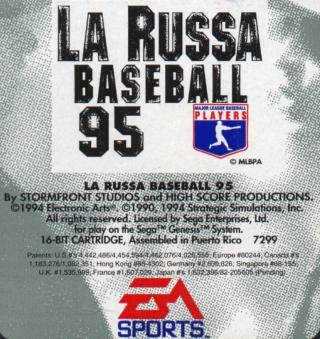 To clarify: LaRussa95 is a great game! Much fun. Pitcher Cam, Bullpens, and lots of sim action! The first game is horrible beyond mention. i have to agree with Brik! this is a very good game! the pitcher batter interface is EXCELLENT! but 95 is a better game. however they took a few things out of 95 that was in the original like moving your batter around in the box and calling plays like hit and run and a few other things were taken out.. i didn`t like this at all! 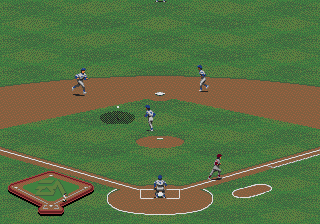 but for sim-style of baseball i would take this game over tripleplay any day of the week! especially LaRussa 95! when i wanted to play a fun little game of arcade baseball that had good graphics i would play TP but when i wanted to play a serious game of baseball it was this one! 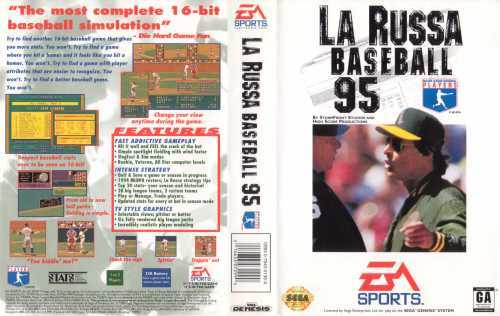 and if you`re into stats and sim-style side of sports gaming this game is it and its a monster when tracking stats.. it tracks more than some of the new baseball games out on like xbox and ps2!! great game!! i still play this game occasionally!